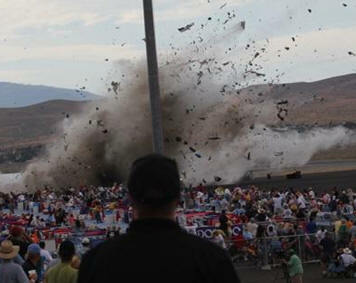 August 27, 2012 - The National Transportation Safety Board determined today that deteriorated locknut inserts found in the highly modified North American P-51D airplane that crashed during the 2011 National Championship Air Races in Reno, Nevada, allowed the trim tab attachment screws to become loose, and even initiated fatigue cracking in one screw. This condition, which resulted in reduced stiffness in the elevator trim system, ultimately led to aerodynamic flutter at racing speed that broke the trim tab linkages, resulting in a loss of controllability and the eventual crash. On September 16, 2011, as the experimental single-seat P-51D airplane "The Galloping Ghost," traveling about 445 knots, or 512 mph, in the third lap of the six-lap race, passed pylon 8, it experienced a left-roll upset and high-G pitch up. During the upset sequence, the airplane's vertical acceleration peaked at 17.3 G, causing incapacitation of the pilot. Seconds later, a section of the left elevator trim tab separated in flight. The airplane descended and impacted the ramp in the spectator box seating area, killing the pilot and 10 spectators and injuring more than 60 others. "In Reno, the fine line between observing risk and being impacted by the consequences when something goes wrong was crossed," said NTSB Chairman Deborah A. P. Hersman. "The pilots understood the risks they assumed; the spectators assumed their safety had been assessed and addressed." Contributing to the accident were the undocumented and untested major modifications made to the airplane, as well as the pilot's operation of the airplane in the unique air racing environment without adequate flight testing. Although the Federal Aviation Administration required that a flight standards district office be notified in writing of any major changes made to The Galloping Ghost before it could be flown, investigators could find no records that such notifications were made except for the installation of the boil-off cooling system. The undocumented major modifications were identified through wreckage examinations, photographic evidence, and interviews with ground crewmembers. - Tracking the resolution of race aircraft discrepancies identified during prerace technical inspections. Eligibility Requirements for Aircraft with Major Modifications - recommendations A 12 9 and A-12-13 classified "Open—Acceptable Response"
Prerace Technical Inspection Discrepancy Tracking - recommendation A 12 10, classified "Closed—Acceptable Action"
Spectator Safety - recommendations A 12 14 and 15, classified "Closed—Acceptable Action"
High G Training, G-Suit Feasibility for Pilots - recommendations A 12 11, -12, -16, and -17, classified "Closed—Acceptable Action"
A tenth safety recommendation, issued to the FAA, which addressed air race and course design guidance was reclassified as "Open—Acceptable Response" on July 25, 2012. "It's good news for the air races that so many of our recommendations have been addressed," said Chairman Hersman. "We will continue to push for the full implementation of all of our safety recommendations."